Comments: Benjamin Lewis Dillard was born September 4, 1857, and was the son of George Walden and Lucy Dillard, who lived at Mill House on Glendower and at Chester in Scottsville. G.W. Dillard owned various properties in Scottsville, including the old Eagle Hotel (later known as the Carleton House) on Valley Street from 1872-1880. Other children of G.W. Dillard included Alice Elizabeth, James Daniel, Julia P., William Barclay, Mary Eleanor, Martha L., George Mason, and Nora L. Dillard of Scottsville. Benjamin Dillard received his medical degree from Johns Hopkins University and returned to Scottsville to marry first, Maude Baptist (b. Nov. 25, 1870; d. Oct.02, 1905) of South Garden. After his wife died in 1905, Dr. Dillard moved his young family into the Barclay House on Main Street. His medical offices were located on the second floor of the Fidelity National Bank on Valley Street. Dr. Dillard was deemed an excellent doctor by Mayor Raymon Thacker, a former patient. Dr. Dillard later married Mildred Scoville Horsley, who ran the Travelers' Rest Hotel just up Main Street from the Barclay House. Mildred was a descendant of Merriwether Lewis and the sister of Fannie Horsley, who married Reeves Nicholas of Scottsville. Dr. Dillard's children were Benjamin, McGruder, Edward, Maude, Sarah (married Richard Haines); and Martha (married Lindsay Pitts). Many of his children graduated from Scottsville High School. Dr. Benjamin Lewis Dillard died on April 12, 1929, and is buried at Scottsville Cemetery. Benjamin L. Dillard, M. D. Since graduating in medicine in 1883, Doctor Dillard has had a busy and successful professional career, and for many years has carried on the work of his profession in his native community of Scottsville. He is an accomplished surgeon, and probably does more surgical work than any other doctor in this section of the state outside of hospitals. 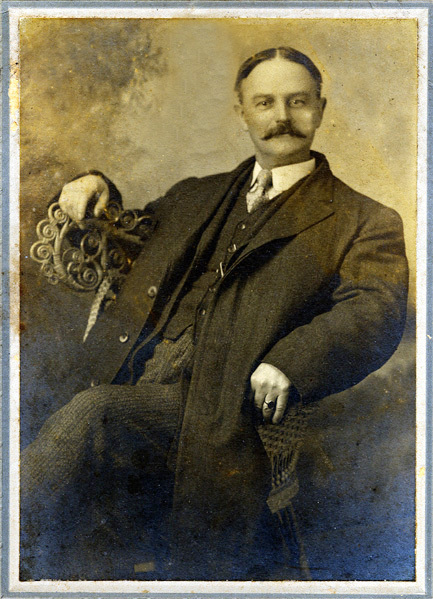 Doctor Dillard was born at Scottsville, September 4, 1857, son of George W. and Lucy J. (Dillard) Dillard. His parents were of the same family name but not related. The Dillards are an old and prominent Virginia family. His father was born in Bowling Green in Caroline County and his mother in Spotsylvania County, his father receiving a common school education, while his mother was educated by a private tutor. George W. Dillard moved to Albemarle County during the forties, was a merchant, and at one time was the largest tax payer in the county. He was an active member of the Christian Church, became a republican after the organization of that party, and served as postmaster of Scottsville for several years. Of his nine children eight are living: James Daniel, a minister of the Christian Church at St. Louis, Missouri; William B., an attorney at Saint Helens, Oregon; George M., who is practicing law at Norfolk, Virginia; Doctor Benjamin L.; Miss Alice; Julia B., wife of Doctor Balbour Gillespie; Mary E., wife of James P. Holiday; and Miss Nora L.
Doctor Benjamin L. Dillard was reared in Scottsville and Charlottesville, attended private schools, and in 1883 received the M. D. degree from the University of Maryland. He has performed his professional work in several cities, including Lynchburg and Alberene, but for many years has been a resident of Scottsville. He is a member of the County and State Medical Society. In September, 1893, Doctor Dillard married Miss Maude Baptist. Six children were born to their union, five now living: Sarah B., wife of Richard Haynes, of South Boston; Maude, wife of James Daugherty; Benjamin L., Jr., of Atlanta, Georgia; Edward, of North Garden, Virginia; and A. Magruder, at home. The mother of this family died in 1911. In 1918 Doctor Dillard married Miss Horsley. He is affiliated with Scottsville Lodge No. 45, A. F. and A. M., and is a democrat.